I am an Exeter-based artist and textile designer. Nature is the greatest inspiration for my art, be it painting, screen printing or monotypes, which at times are transformed into my designs or cards. I am very excited to be exhibiting for the first time at the Craft Festival. 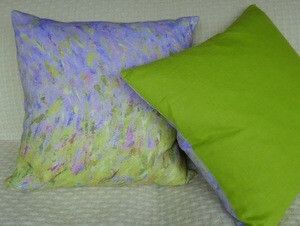 I invite you to come and see my vibrant cushions, tea towels, shopping bags, prints and greetings cards. Get ideas on freshening up your home. You can follow me on Instagram to see fresh products: AnnukkaCostelloArt.